The emergence of a new civil service was due to launched in early 2000-ies of the Technical regulation reform. 2011 – the year of the beginning of the existence of the Federal service for accreditation or the Federal service for accreditation. In five years of existence, the Federal accreditation service has become a powerful state mechanism to assess the activities of accredited organizations. The Federal accreditation service is a state body of Executive power performing the function of a National body of Russia for accreditation and reporting directly to the Ministry of economic development. Under the function of the National accreditation authority means: the creation of a unified national accreditation system; control of activities of accredited organizations; accreditation organizations; issue of forms of certificates of compliance; oversight of testing laboratories; maintaining registers of certificates, declarations, certification bodies and testing laboratories accredited individuals, experts, expert organizations. Official site of the Federal service for accreditation is located at: http://fsa.gov.ru/. 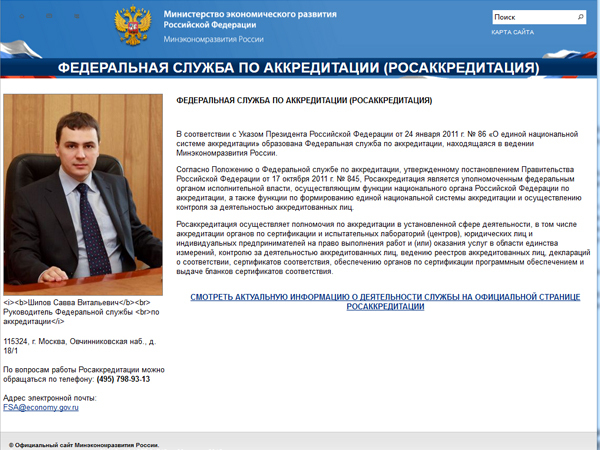 Besides, on the Official website of the Ministry of economic development of the Russian Federation is the Federal service for accreditation - http://economy.gov.ru/wps/wcm/connect/economylib4/designElements/rosakkred/. The website of the Federal service for accreditation is earned at the end of 2011, and in 2012 has got convenient online services. 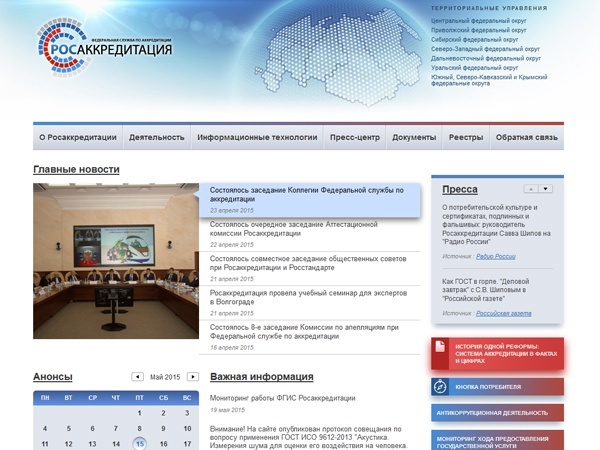 Currently, the website is a comprehensive portal services for organizations and citizens of the Russian Federation. 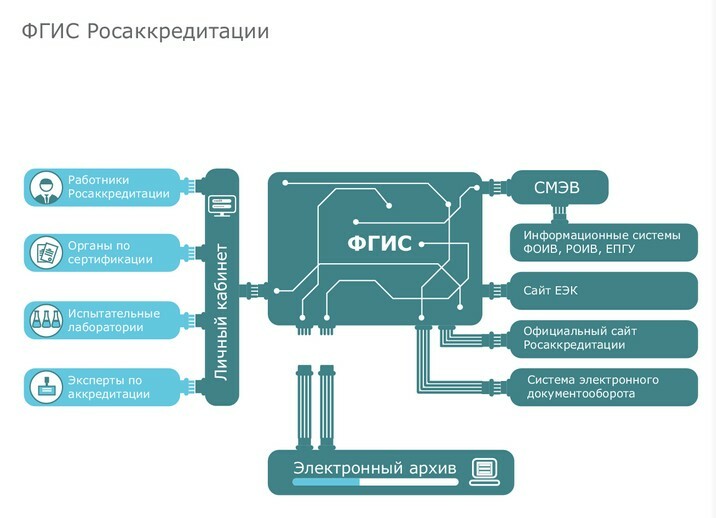 In addition, the site contains a lot of useful consumer information on products certification in the Russian Federation, testing laboratories, certification bodies and other organizations and experts. List of functions: providing public services online with the possibility of monitoring, informational support of accredited organizations, FGIS, the Federal accreditation service (on-line service of the organization of works on certification and testing), electronic check returns, news section, registers of certificates, declarations, accredited officials, experts and expert organizations. The emblem of the Federal service for accreditation is as a Sign of national accreditation system of the Russian Federation. 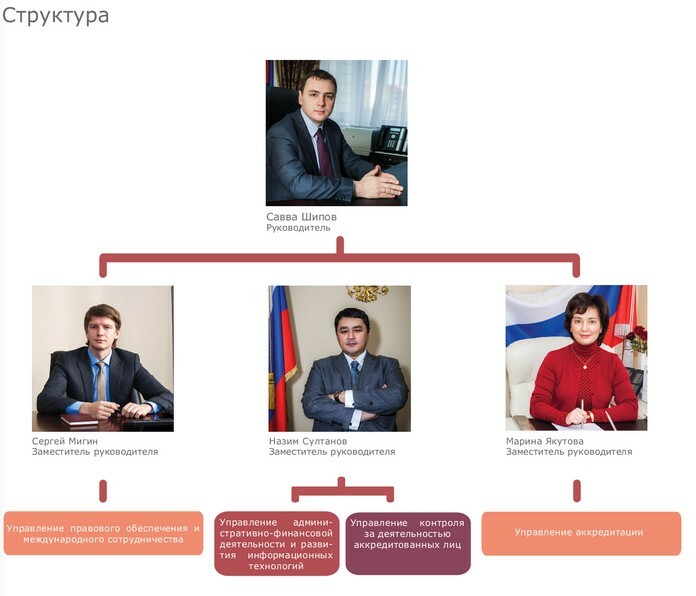 by order of the Ministry of economic development of Russia from may 22, 2014 No. 283) and can be used by persons included in the register of accredited entities. Early 2011 - mid 2012. The organizational period. Organization of activity of Federal service for accreditation, development of priority regulations. The second half of 2012 - beginning of 2013. A period of transition. The adoption and implementation of the priority regulations, the establishment of information systems accreditation, the beginning of work of territorial bodies. The beginning of 2013 to mid - 2014. The period of implementation of the final model. The adoption of the Federal law "On accreditation" and the relevant regulations. Create and commence implementation of the FGIS. The second half of 2014 - present. Full implementation of the FGIS, the introduction of the quality management system, international recognition of the Russian accreditation system. Federal state information system "FGIS, the Federal service for accreditation is one of the key instruments of reform of the certification system of Russia, which, in the case of successful design and implementation of active, repeatedly will increase the efficiency not only of the Federal service for accreditation, but accredited organizations and virtually "negate" korruptsinogennostj certification system, which in Russia is familiar to you. As a result, full implementation of the FGIS will benefit primarily consumers of products and services.